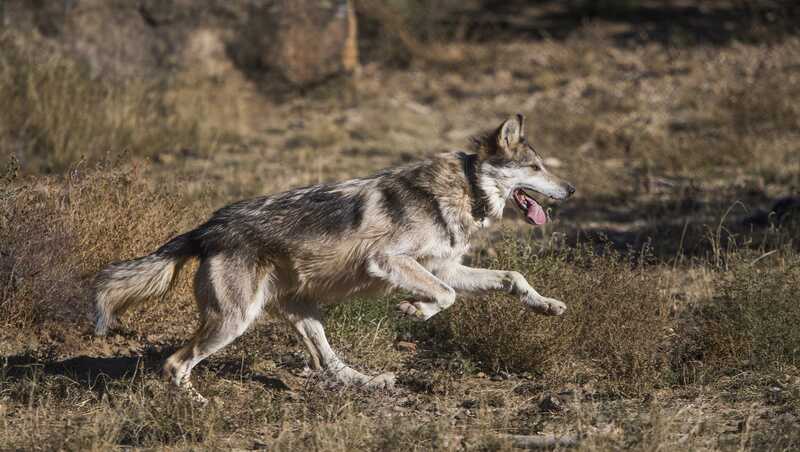 The endangered Mexican gray wolf population leveled off in 2017 after showing stronger growth the year before.The population grew by at least one, to 114 wolves in the wild throughout Arizona and New Mexico. There are 22 wolf packs in the two states.Although the 2017 gains were marginal, it remains the highest count since reintroducing captive wolves to the U.S. began in 1998. But while the gains were higher in recent years, the total population has only grown by four since 2014.MORE: Mexican gray wolf population hits high of 113At least 63 wolves were counted in Arizona in 2017, the same as the year before, state and federal wildlife agencies reported. The Mexican government recorded about 31 wolves roaming in their northern states last year. When the annual Mexican wolf population count came out earlier this week, one notable Mexican wolf pack was missing for the first time in 20 years.Ever since 1998, when the 11 founder wolves were first released in southeast Arizona, the Hawk’s Nest Pack has roamed the White Mountains and the volcanic plateau that flanks its high peaks. There, amongst the ponderosa pine savannahs and plentiful elk herds, the pack raised many young, including the first wild-conceived, wild-born Mexican wolf pup. There have been three confirmed sightings of wolves in the Netherlands so far this year, website Nature Today said on Wednesday.On Wednesday morning, a wolf was spotted in several locations in Gelderland and was caught on video walking along the edge of fields.A wolf was seen in several places in the east of the country around the beginning of January and again in Twente in early February.‘In general wolves are wary animals so it is likely that the Netherlands is visited more often,’ the website said. ‘However, there is no sign yet that wolves have made the Netherlands their permanent home.’The first confirmed sighting of a live wolf on Dutch soil since 1869 was made in 2015. A dead wolf was found in Flevoland in summer 2013 but research showed it had probably been dumped there. Ontario Hubs field producer Jeyan Jeganathan visits Algonquin Park, one of only a handful of places the Algonquin wolf calls home. A Klamath Falls woman had a unique experience with a wolf at Crater Lake National Park on Wednesday and was able to capture photos of the encounter.Erika Clements said she was making her daily deliveries to the park for UPS when she came around a corner and saw what appeared to be a dog digging in the snow.As she drove closer she realized it wasn’t a dog or even a coyote, but an endangered gray wolf.“It was quite amazing,” said Clements. “It’s a beautiful park and you know those things are out there, but it’s completely different when you see it.”Clements said the wolf jumped down from a snow bank and walked around her delivery truck before jumping onto the snow on the other side of the road. She said it was “surreal” being that close to an animal that was both beautiful and threatening.“You know it’s a wolf, you know it’s dangerous,” she said.After returning to Klamath Falls, Clements printed photos of the wolf and presented them to park rangers, who turned them over to biologists. She said the biologists presumed the wolf must have been young, given it was so curious about the truck. They also commented about seeing wolf tracks earlier in the west side of the park.Park staff said Saturday an authorized spokesperson would not be available for comment until Tuesday. One of Wisconsin’s most charismatic and controversial wildlife species – the gray wolf – will take center stage at the 2018 Milwaukee Journal Sentinel Sports Show.A seminar and panel discussion featuring several of the state’s foremost authorities on wolves is scheduled from 3-5 p.m. March 10 at the show’s seminar stage. A new plan announced by the government represents a rise of nearly 40% in the wolf population.After being eradicated by hunters in the 1930s, the wolf made its way back into France from Italy in the 1990s.Wolves are listed as a protected species by the Bern Convention that France has signed up to. France on alert for prowling wolves Wolf hunters deployed to French Alps Wolf makes a comeback in FranceAnimal rights groups had been pushing for a more radical proposal and accused ministers of lacking political courage.In a gesture to farmers, the government said that hunters in France would still be allowed to cull 40 wolves this year, the same as in 2017. Up to 10% of the wolf population could be culled every year from 2019, and that proportion could rise to 12% if more frequent wolf attacks were registered.Almost 12,000 sheep were killed by wolves in France in 2017 and the government has come under strong pressure from farmers in French regions – particularly in the Alps and the Pyrenees.